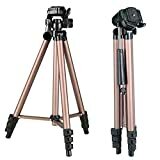 Adjustable-height tripod made of lightweight aluminum; Compact tripod for photo and video shooting. This lightweight tripod is perfect for most cameras up to 2kg. The set-up is quick and easy. The leg locks are easy and smooth to release and will easily glide to your desired height. 3-way head allows for tilt and swivel motion; This combined with the smooth panning 3-way tripod head means that images and film can be captured from a variety of different angles in order to achieve the best perspective. Quick-release plate allows repid release or switching between different cameras; If you are in possession of several cameras, an integrated quick release plate allows cameras to be quickly interchanged with a simple clip on installation/removal for when you are in a hurry. 4-section, lever-lock legs for easy height adjustments; The leg locks are easy and smooth to release and will easily glide to your desired height. It is fit for any digital camera with 1/4″ screw; Provided with a portable free zippered bag, easy to carry, making outdoor photography more convenient. This entry was posted in Discount Photography and tagged 3Way, Alloy, Aluminum, Brown, Camera, Cameras, Canon, Capacity, Concept, Degree, Digital, DSLR, GoPro, Head, Lightweight, Load, Nikon, Plate, Portable, Quick, Release, Sections, Sony, TL20231, Traveller, Tripod by Ball Photo. Bookmark the permalink.